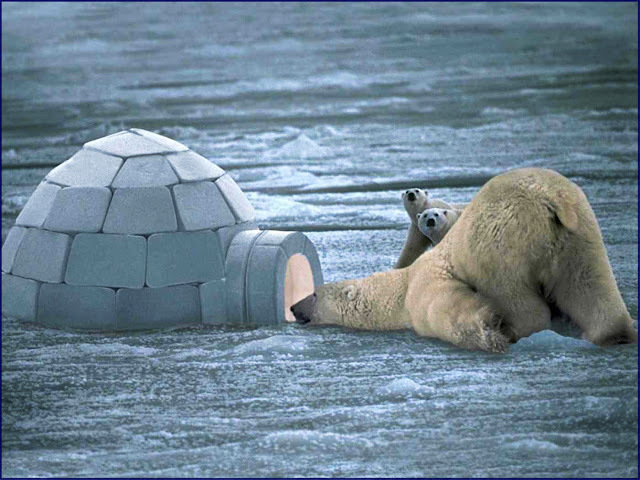 Chrionex: Mama Polar Bear and her cubs are looking inside their neighbor's igloo. Mama Bear asks in a southern drawl " Y'all keeping warm in there? Looks like you need more fish... that's not even enough to feed one of my babies! Be right back with lots more for all y'all!" Mama Polar Bear and her cubs are looking inside their neighbor's igloo. Mama Bear asks in a southern drawl " Y'all keeping warm in there? Looks like you need more fish... that's not even enough to feed one of my babies! Be right back with lots more for all y'all!"